Author's update February 13, 2017: This deleted text message photo recovery post relies on the old buggy attachment deletion that was fixed in iOS 8 and later. You may still have very old attachments lurking on your iPhone if you setup your iPhone from iTunes or iCloud backup since the iOS 7 and earlier days. We have a new article about previewing and saving all of the Messages app photos and videos, which also talks about looking for old lurking deleted Messages app photos, if you want to take a look. Accidentally deleting text messages can be devastating, especially if you have photos or videos in those messages that you treasure. Thankfully, deleting photos and video text-message attachments doesn't always work correctly on the iPhone1 (or iPad & iPod Touch,) and sometimes we can get those images back. Back in 2014, I wrote an article about why photos, videos, and other attachments in text messages might be recoverable. This post builds on that article to discuss how to use Decipher TextMessage to recover those deleted photos. Decipher TextMessage is going to look through your iPhone backups, to find text-message attachments that haven't been fully deleted from your phone. Step 0: Don't touch your phone yet! Before we do anything with your phone, we're going to search your computer (automatically) for any existing iTunes backups. Even if you don't think you've backed up recently, iTunes occasionally runs a backup when you sync your phone, so it's worth a look. 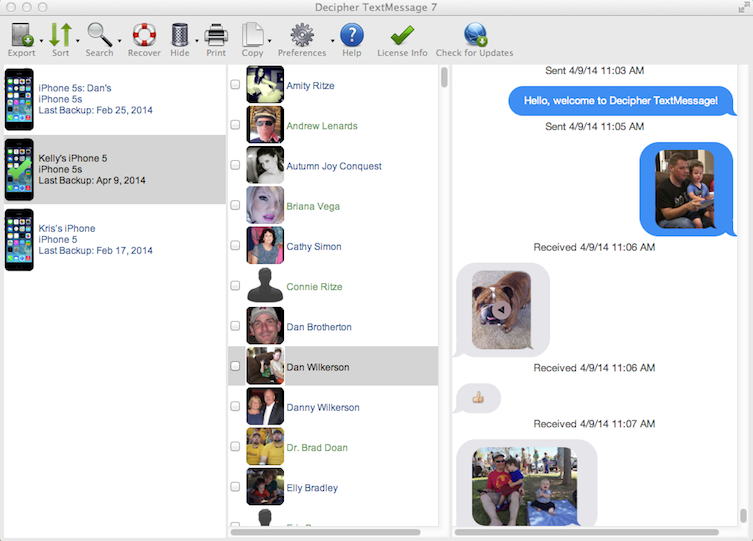 If the photos you erased are sitting not-erased in a backup already, our job gets significantly easier! Download the free trial of Decipher TextMessage from https://deciphertools.com/download-decipher-textmessage.html, install it, and run it once. As Decipher TextMessage starts up, it will scan your iTunes backup directory automatically and look for any backups you already have on your computer. In the main program window, you'll see all of your iOS devices2. Click on the device you're interested in if it is there2 and click on the contacts for which you want to view photos you've sent via text message. If the messages were not deleted when this backup was taken, then you'll see the photos here! Take a quick look in main Decipher TextMessage window to see if the messages you deleted are in your older backups. Plug your iPhone into your computer using the USB cable3. iTunes with the iPhones listed on the left side of the window. iTunes with the iPhones listed in a button in the upper-right corner of the window. Once you've selected your iPhone, the summary screen will appear in iTunes. 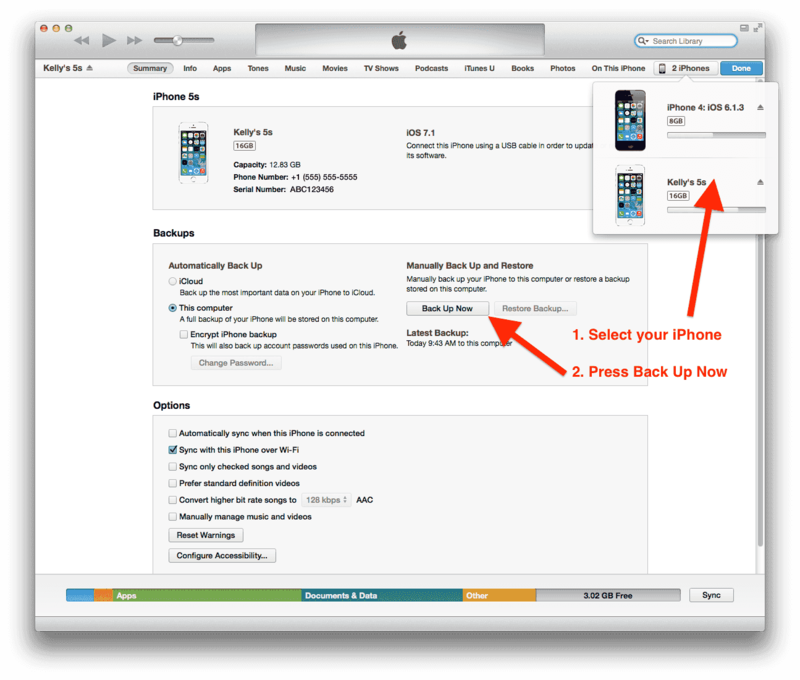 In the Backups section, uncheck the "Encrypt iPhone Backup" option if it's checked and press the "Back Up Now" button. Wait patiently until the backup completes, which could be a few minutes if it's been a while since your last backup. You can see view the progress of the backup at the top of the iTunes window. Close Decipher TextMessage if it's still open from step 1, and reopen it. 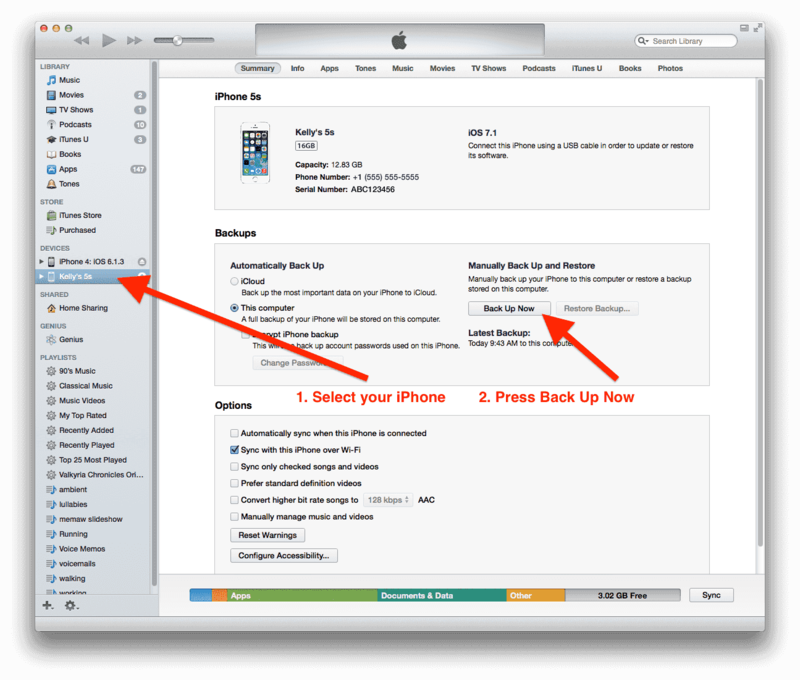 After the new backup is imported into the program and the main window appears, select your iPhone from the list of devices on the left side of the window2 and then press the Recover button. In the drop-down menu that appears, select to "Recover Deleted Attachments." 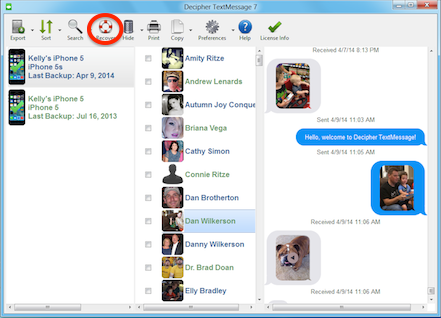 Use the recover button in Decipher TextMessage to search for deleted text messages. A new window will open with the results of our search for deleted text attachments. This results page is brand new, so we hope you'll contact us if you have questions or see issues! 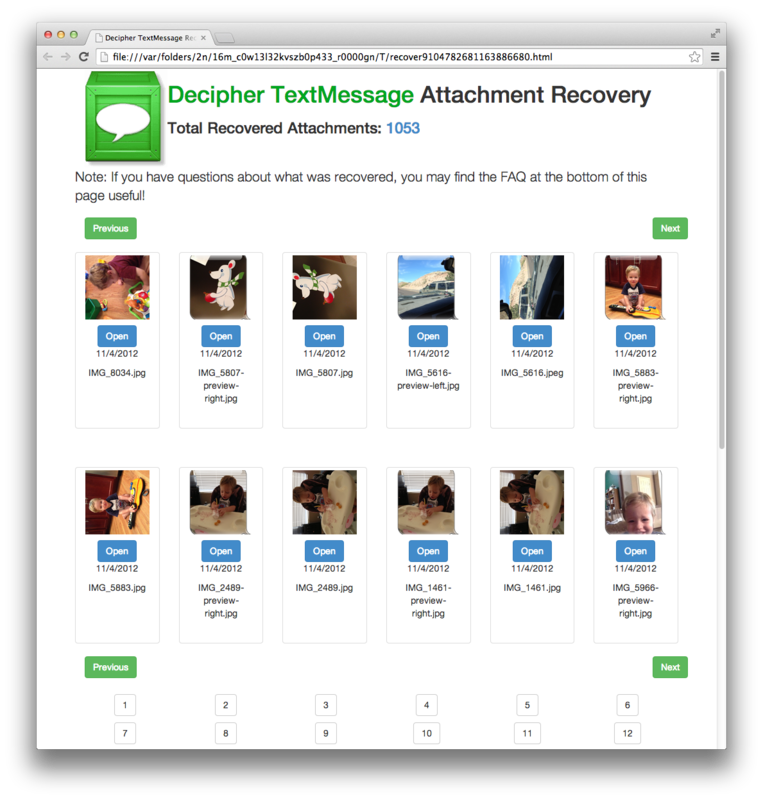 The deleted attachment recovery screen in Decipher TextMessage. We hope this guide helps you find the important deleted photos! If you have questions, please leave a comment below, or contact us directly. We know your text-message communications are important, and we're happy to help as best we can! how do you save all recovered images? (I apologize for the delay, I don't know how this comment slipped past my radar.) Do you still need to save a big batch of recovered images? I just realized the "save all" isn't in our most recent update, and I need to get that fixed. Let us know if you need us to send you that new version to get your images saved. If not, in the meantime, you can click on individual images to open them and save a copy, which might work well if you need to filter out some images, or just have a couple to save.